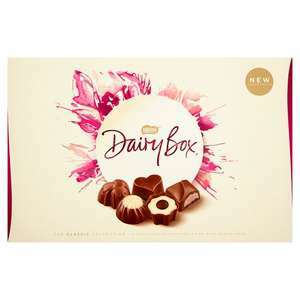 Thought these were great value,pretty large double layer box....supposedly half price.Bought a few boxes earlier. My local Bookers give these away free on their 'Thank you day', along with a bacon butty and drink. Very good selection of surprisingly excellent quality for budget priced chocolates. At least ten times better than Mondelez Milk Tray. Work it out...the double layer smaller boxes are 360g...these are 720g lol,its like 2x360g stuck together...I've saw the single layers,those boxes are half the thickness of these. I'll confirm when I eat them lol. 5.99 in B&M and usually always is. Work it out...the double layer smaller boxes are 360g...these are 720g …Work it out...the double layer smaller boxes are 360g...these are 720g lol,its like 2x360g stuck together...I've saw the single layers,those boxes are half the thickness of these.I'll confirm when I eat them lol. I was refering to the fact you said it was double layered... pretty sure it isnt. So i dont have anything to work out. I was refering to the fact you said it was double layered... pretty sure …I was refering to the fact you said it was double layered... pretty sure it isnt.So i dont have anything to work out. Thanks, just had this delivered with my grocery shop. Deal posting newbie! This is BattleBeast1 first deal post. Help out by leaving a posting tip or just to show your appreciation for their contribution.